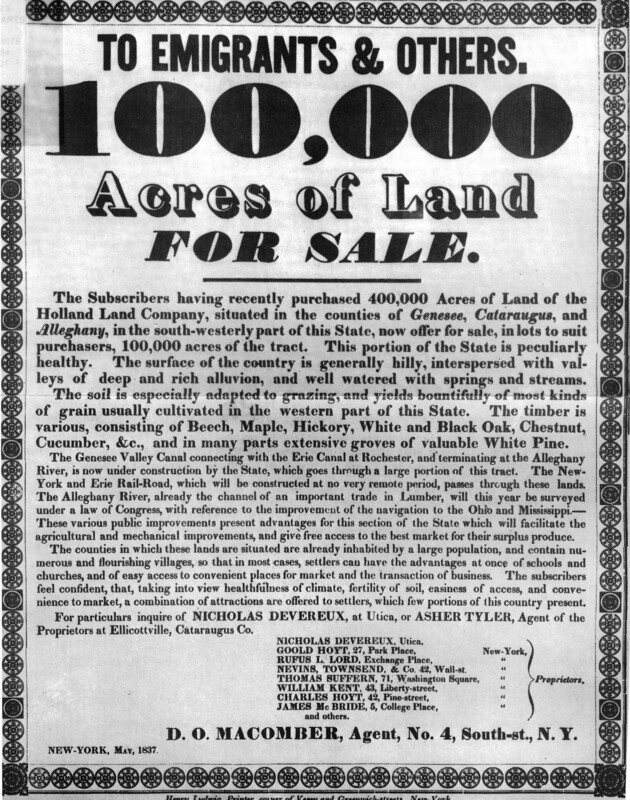 Poster printed in New York City advertising land for sale in Genesee, Cataraugus (Cattaraugus), and Alleghany (Allegany) counties in the southwestern part of New York State, originally part of the Holland Land Company's vast tracts. The advertisement mentions as inducements to potential buyers the area's favorable climate and soil for farming (especially grain), the proximity to the Genesee Valley Canal and the Erie Canal, and the presence of existing settlements. Dubois, Muriel L. New York State History. Adapted by Muriel L. Dubois and Janet Morrissey from the Jackdaw New York State by Andrew Bronin. Amawalk, N.Y.: Jackdaw, 2001. Macomber, D. O., “Broadside advertising land for sale in Western New York, 1837,” OpenValley, accessed April 25, 2019, https://openvalley.org/items/show/67.